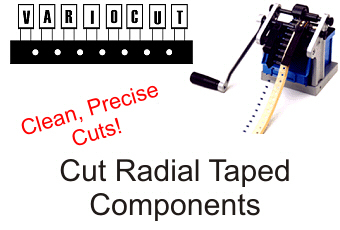 Accurately cut and bend taped axial components with Cutbend lead forming or cut radial taped components with Variocut lead cutting machines. All machines are easy to set up and are built to last. Cutbend and Variocut lead forming machines can process up to 40,000 components per hour and offer quick-change cut and bend settings. All component cutting and bending machines are built to last for years of use. We also stock spare parts. Several models to fit your needs! Schleuniger offers several Grip Technologies lead cutting and bending machines. Process up to 40,000 per hour! 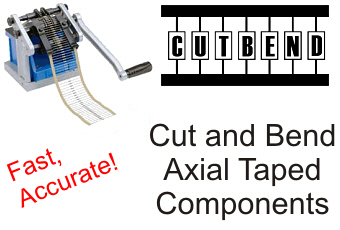 Change component cut and bend settings in just minutes with our unique CUTBEND adjustment tool. Convenient accessories speed component feeding. Flexible design allows attachment of in-line component counter providing total processing system. Ergonomically designed for mounting on from edge of worktable. Fast installation with a simple clamp; easy to relocate. Small, compact size makes it easy to store… freeing up valuable work space. Proven world class design... precision engineering. Over 35,000 machines installed throughout the world. Rugged construction assures many years of use. Incredible low machine cost assures fast payback!